Originally designed for Super Stock campaigners and today used on all Super Comp, Super Gas and bracket classes as well, this design moves the sump completely to the rear, where it should have been in the first place, and where the oil wants to go! Fits '65 and later chassis for all Wedge and Hemi engines. Pan and a Milodon oiling system will allow the 8500 RPM plus range. Uses a tie rod tube through which the drag link is inserted after engine installation. Minor drag link modification may be necessary due to frame, steering and engine mount misplacement or movement from stock. Milodon's Drag Racing Oil Pans are designed to provide maximum performance and lubrication for your engine during adverse conditions like rapid acceleration. 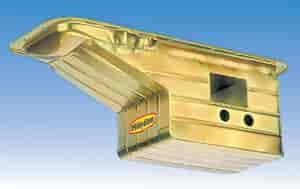 Each pan features a sump and baffling that is engineered to give you more horsepower and oil control. Milodon's distinctive gold irridated finish ensure long lasting durability and reliabilty. Any dipstick will work, like this option https://www.jegs.com/i/Trans-Dapt/969/8904/10002/-1 You will have to maerk it for the proper oil level after you add oil to the engine.